Nice pictures Gazza. Amazing we all walked around the place and we took different pictures. I think this is my favourite though, it just looks so unreal, or is it real???????? and i still have most of it. Great photos Gazza & Bob et al. I can easily pick up a few ideas from these for my own small projects.What boils my blood looking through all those lovely landscapes is that there is no bamboo. Like the prize village idiot [whilst in a Japanese mood] I planted some and now wish I hadn't. Never take bamboo out of the pot. Not sure if there are too many people still following this long thread, so thought I'd liven it up a bit with this picture. 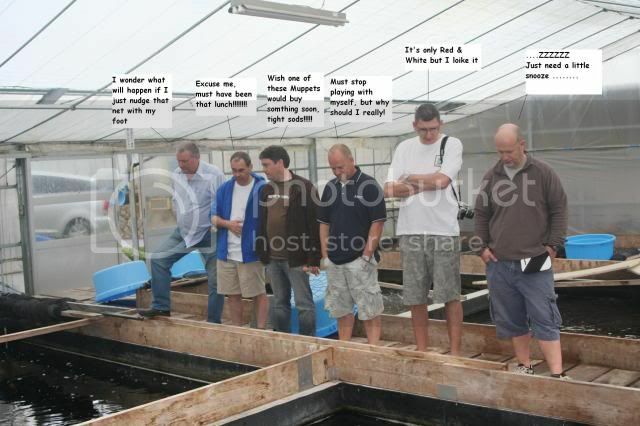 So was this what they were thinking, as I snapped this pictures of a bunch of Muppets stood there looking in a pond????? Any idea's anyone?????? What else could have been going through their minds??????? Keep everything on this thread Gazza, when we've finished posting those thousands of pictures we have, we can put the thread in the historic post area and then look back next year and reminisce!!!!!! !